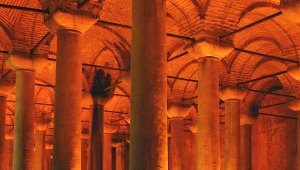 Basilica Cistern is a former underground water storage area in Istanbul. Today it’s a tourist attraction where you can enjoy live music concerts and see just how ingenious the Byzantines really were. There are over 300 columns inside the cistern and a number of walkways have been constructed so that you can walk around with ease. The most impressive part is the ceiling which tops the columns and even with the dim, red lighting, you can see the beautiful workmanship in creating a stone roof over the cistern. At the base of the cistern, some water remains to give you the effect of what this place was. Of course, in years gone by, the whole room would have been full of drinking water for this neighbourhood of Istanbul. There are a number of these cisterns still in existence in the city, but this is one of the best and largest to visit. They were important to secure a clean and reliable supply of water for the city’s inhabitants, even in times of conflict. The water inside the cistern, was piped by a long network from streams outside the city. We found the whole place fascinating and enjoyed wandering around. Of particular interest are the bases of two columns which have clearly been used elsewhere as they have had carved into them, detailed images of Medusa. It’s not known how they got here, but you can follow the signs to see them. Basilica Cistern is adjacent to Sultanahmet Square. Use the Sultanahmet tram stop to get here, or the Istanbul Big Bus Hop-on, Hop-off Tour.